3 Bedroom Flat For Sale in West Sussex for Asking Price £695,000. The space at Summersdale Place has been meticulously designed for modern living, with spacious light filled accommodation, thanks to the high ceilings throughout. Every detail has been well considered and finished to an exceptionally high standard. This includes designer kitchens, luxury bathrooms and outdoor living spaces. 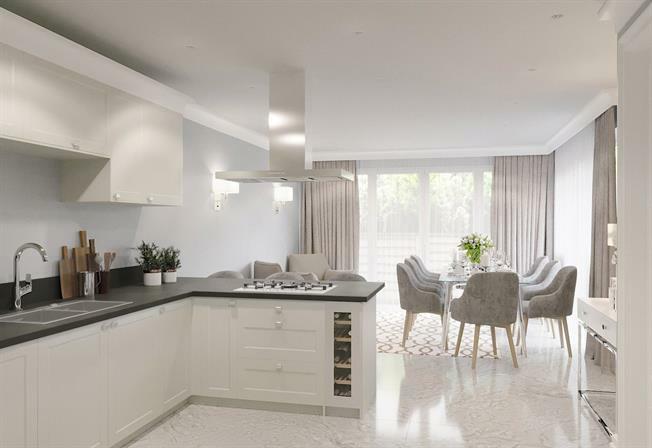 1 Summersdale Place is a three bedroom ground floor apartment featuring an impressive open plan kitchen dining living room with breakfast bar. Doors from the kitchen dining living room open directly onto the private enclosed south facing garden with rear access gate. There are three double bedrooms all with built in wardrobes, with the master bedroom benefiting from an ensuite shower room. The master and second bedroom both open out onto the privately enclosed garden. There’s also a full family bathroom, a separate WC, storage cupboard and spacious utility room also with large storage cupboards built in. There’s off road allocated parking for two cars plus guest parking. Summersdale Place is located in leafy Summersdale just 1.2 miles north of the city centre. It’s an easy 20 minutes’ walk to the high street in Chichester. The city of Chichester lies in the heart of the Downs yet easily accessed by train from London Victoria in 90 minutes. The A27 connects you to all the nearest major cities; Brighton, Portsmouth and Southampton.